Vince Rogers Jr. was faithful to the Buffalo Bisons, which to him meant rooting for minor league baseball and hockey teams of the same name. 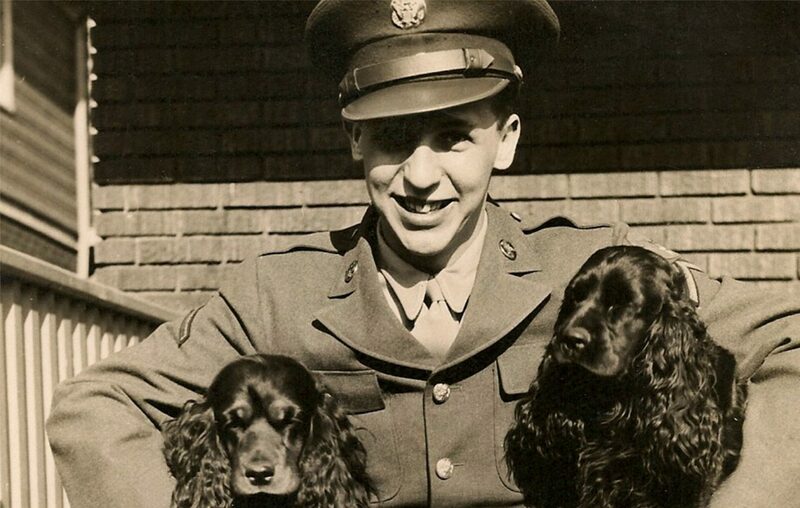 He emphasized that loyalty in his letters home from World War II, a chance for the Army Air Force staff sergeant to reflect on how enough heat and big insects could actually make a guy long for snow. 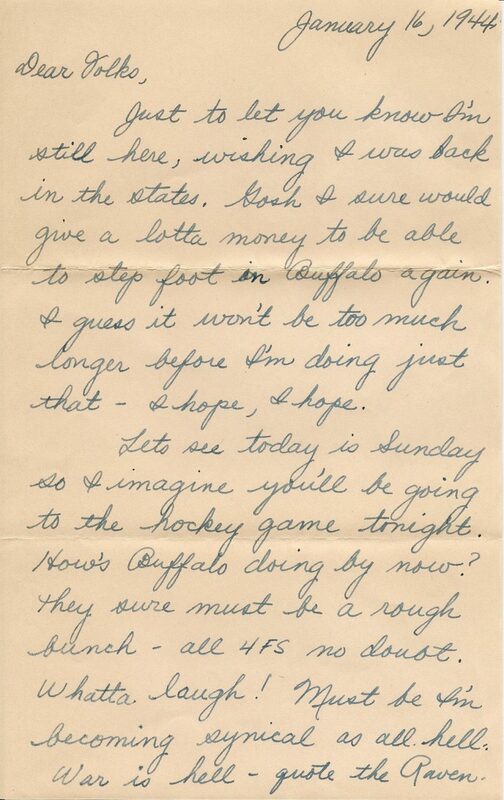 “Gosh, I sure would give a lotta money to be able to step foot in Buffalo again,” Rogers wrote in a final letter to his parents, Ruth and Vincent Sr., who lived on Huxley Drive in Snyder. He was their only child, and he often mentioned how much he missed his folks and the two family dogs he called “the girls,” Music and Melody. Above all else, he looked forward to reuniting with Betty Meinhold, the young woman he intended to marry from Wellington Road in Buffalo. He told his parents he expected, in the coming months, to receive some furlough time. “Well, it won't be long till your pride and joy is home again,” he wrote in November 1943. That dream never happened. The 21-year-old radio operator his cousins knew as "Buddy" died two months later, when “The Miss Bee Haven,” a B-24 Liberator bomber, crashed in a lagoon while attempting to embark on a night mission from Tarawa atoll. Of a crew of 10, Vince and six others were killed. At war's end, he was listed as missing in action. It took 75 years, but that status has changed. The Pentagon confirmed last week that Rogers' remains were positively identified through a partnership with History Flight, an organization dedicated to bringing home missing Americans from World War II. Sgt. First Class Kristen Duus, spokeswoman for the Defense POW/MIA Accounting Agency, said Rogers is entitled to a military funeral once his relatives choose a place of burial. While another Erie County man, Staff Sgt. Jack Busch, was also among those killed in the crash, Busch's remains came home years ago. Rogers, with three other crewmen who were recently identified, was buried at Tarawa and then slipped into mystery. He was found beneath a house and the roots of a 50-foot breadfruit tree, according to Mark Noah, founder of the Virginia-based History Flight, who said Rogers becomes one of 65 missing servicemen identified at Tarawa as a result of the organization’s efforts. “You’re helping them regain the identity and dignity they lost for so long,” Noah said. At the March Field Air Museum in California, one of several places where Rogers spent time during training, staff members reacted as if they had just heard welcome news about a friend. Michelle Sifuentes, who now works at a museum in Ontario, Calif., was collections manager at March Field 10 years ago, when Wayne Rogers walked in with a cardboard box packed with more than 200 letters and photographs. These were handwritten messages Vince Rogers sent home to Erie County, amid the war. After the death of his parents, with no siblings to claim the letters, the box moved from relative to relative. Tom Rogers, a cousin in Texas, came upon it while cleaning his garage, but could not bring himself to throw it out. Tom, who would later donate a DNA sample to the search effort, passed the letters on to Wayne, 77, another cousin who keeps a photo of Vince displayed in his California living room. Wayne had been involved with some events at March Field, and the museum seemed like a perfect destination. Sifuentes and Jeff Houlihan, director today of exhibits and collections, began reading the letters. They were stunned by the detail and clarity, by the way a well-loved teenager with a gentle sensibility evolved into a hardened airman with a wearier and far more fatalistic view of the world, shaped by war. In distinctive handwriting, Rogers calls his mother and father “the swellest parents a fella ever had.” He often mentions the fortunes of the baseball and hockey Bisons, including a wry observation from the Pacific as to how all the hockey players could be classified as 4F, meaning physically unable to serve. Even then, he wonders if he is becoming "synical as hell." He observes that it “must seem funny to have two people working in the family” when his mother takes a wartime job in a defense plant, a familiar pivot that was part of a vast change in the nature of working America. The letters are never sugarcoated. Houlihan marvels at how Rogers did not hesitate about providing a graphic account for his parents of a visit to a brothel, where he writes that he abstained out of fear of disease. Once he leaves for the Pacific, he experiences an increasingly harsh grasp of the danger, of his own mortality. While he sometimes writes with a cold and graphic fury about the people of the Axis powers that seems far distant from the teen who left home not all that long before, he also offers a glimpse of the humanity of Japanese soldiers, of their shared will to live. He describes how the crash of another plane kills two friends who “didn’t have a chance,” and he gives a harrowing account of a mission in which his own plane seems ready to go down. The crew makes it back only because the pilot manages to fly between two mountains, a mission that “came darn too close to having a quick ending,” as Rogers puts it. Houlihan and his staff, deeply moved, transformed those letters into an exhibit. It builds toward the telegram that informs Ruth and Vincent Sr. their son has been killed. One edge is torn, and Houlihan wonders if that is a sign of shaking hands, of the anguish of whichever terrified parent opened it. "He really teaches that the greatest cost of war for a democracy is not material or financial," Houlihan said. The cost is measured even now, to Houlihan, by the endless possibilities represented by each lost life. Wayne Rogers said he does not know what direction his cousin would have chosen. 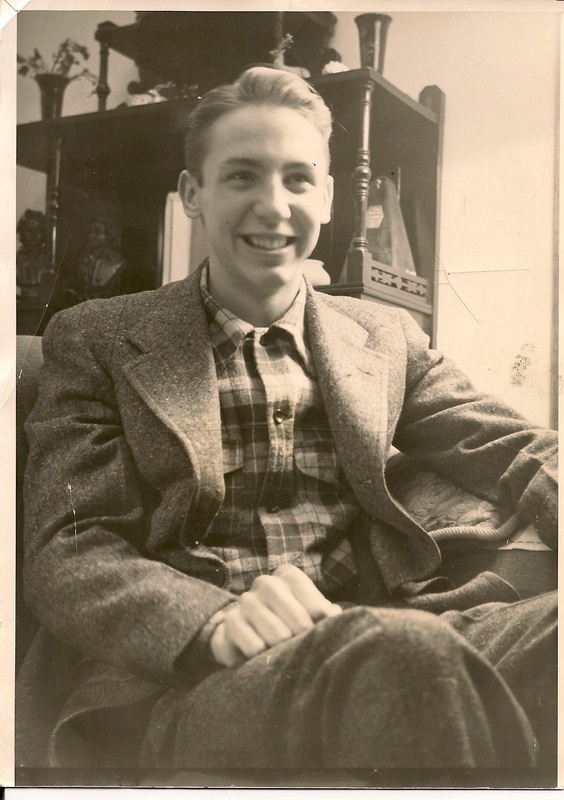 But he was a fine student whose grandfather, father, uncles and several cousins all went to Syracuse University, Wayne said, where his dad was on the rowing team. It is family lore that Ruth, overwhelmed by grief, never fully recovered. She and Vincent Sr., who raised horses, have a gravestone in Yorks Corners, near Wellsville. That cemetery is not far from an old farmhouse where many in the extended family, including Vince, carved their initials in a rock. While Yorks Corners is one option for his burial, Wayne is also thinking about Riverside National Cemetery in California, near the museum. 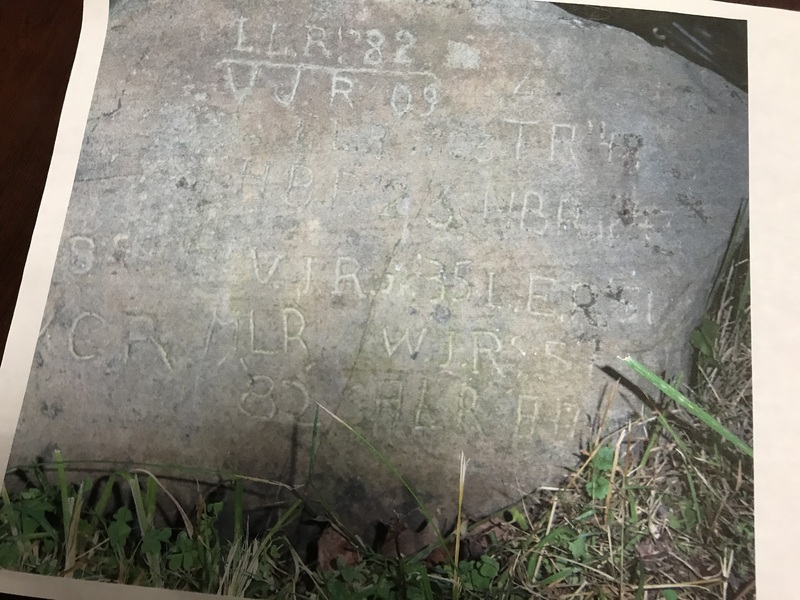 Those familiar with the letters could visit the grave, and it would be an easier spot to reach for surviving members of the family, most long gone from Upstate New York. That is a hard choice, and Wayne and his cousins must sort out a decision. Among the photographs in the box were some of Rogers with Betty Meinhold, his teenage sweetheart from Buffalo. 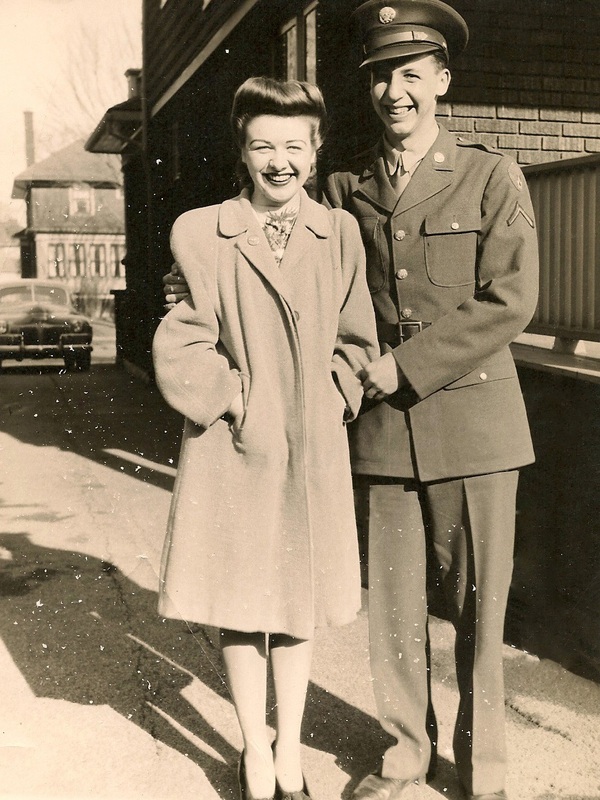 After Rogers was killed, Meinhold met and married Donald Pelloth, a Cheektowaga native who served in the Army during World War II. Pelloth graduated from Cornell University and became a veterinarian. The couple had four children and later moved to Connecticut, where their oldest son Dan, 69, said by telephone this week that he had never heard specific details about Vince Rogers Jr., or his dreams of coming home. Dan Pelloth said his mother, a skilled pianist, died in 1987 from complications linked to emphysema. His father remarried, and died 10 years ago. Both parents had memorable personalities, and Dan said his mother had the kind of welcoming grace that even his childhood friends still remember. “She was an amazing person, just genuine, giving and very warm,” Dan said. Her name is now appearing in national stories about Rogers, an only child who died long ago. Dan said he recalls just one time, a single conversation, in which his mother spoke of it. He was 8 or 9, and she told him how there had been a young man in her life when she was a teen, an airman who never returned from the war. Dan was in elementary school, maybe in the third or fourth grade, but something about the way she said it stayed with him. Sean Kirst is a columnist with The Buffalo News who thanks genealogist Megan Smolenyak for finding links to the Pelloth family, and Katherine Rasdorf of History Flight for assistance in locating relatives of Vince Rogers Jr. Email Kirst at skirst@buffnews.com or read more of his work in this archive.